Most Stingrays that are available for the home aquarium are found on or around coral reefs, rocky reefs, or lagoons. In captivity, vitamin-enriched frozen squid, live ghost shrimp, and other meaty foods should be offered. A large, rounded aquarium (over 100 gallons), sandy substrate, and optimum water conditions are important factors when maintaining stingrays. 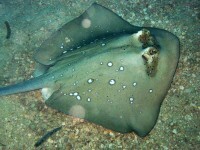 Some stingrays may make inappropriate aquarium specimens for the average hobbyist. However, with the right captive habitat, the advanced aquarist can successfully keep these fascinating animals in large home aquariums. Some of these substrate-dwelling, cartilaginous fishes pack a punch and can cause severe injury, so be sure to do your research before purchasing one. Please note: Stingrays should never be exposed to copper based medications as this will cause them to become ill. Additionally, Stingrays need plenty of open sandy areas free of sharp objects in which to hide in. Water quality must be kept up. Watch for any tail damage on Stingrays due to aggressive tankmates. Many puffers and some eels will tend to pick on the ribbon-like tail. Tail will re-grow with time.